You know you’re in for a wild ride when a film opens with a quote from Chairman Mao…! 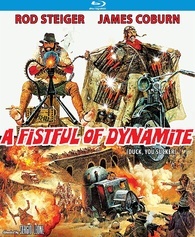 And a wild ride is what you get with Sergio Leone’s 1971 A Fistful of Dynamite a.k.a. Duck, You Sucker! —a fascinating spaghetti western that mixes humor, drama, expansive battle scenes and politics in a topsy-turvy, totally unexpected style. 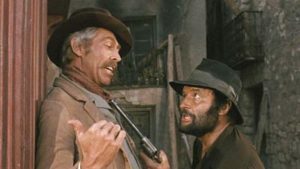 The story behind the movie—the second in Leone’s Once Upon a Time… trilogy, preceded by …in the West and followed by …in America— is as unruly as the film itself, which is impressively recounted in the extras on Kino’s first rate Blu-ray pressing. Italian sagebrush master Leone, who never intended to direct the picture (original director Peter Bogdanovich bailed shortly before shooting began) centers his film on the oddball “bromance” between former motorcycle-riding Irish Republican Army demolitions expert John Mallory (James Coburn, The Great Escape) and Mexican robber Juan Miranda (Rod Steiger, Doctor Zhivago). The two men, from worlds apart, become partners, with Miranda’s interests squarely fixed on stealing cash and Sean obsessed with using his demolitions handiwork to detonate bombs during the ongoing Mexican Revolution. A Fistful of Dynamite has been called on the carpet by critics and Leone fans as a film that can’t decide what it is. Is it a comedic western? A western spoof? A serious political movie? And at the drop of a sombrero, it abruptly shifts from scenes of slapstick to sequences that seem to come from epic war dramas. The chemistry between smooth Irish mercenary Malone and grizzly salt-of-the-earth Miranda is at the center and works wonderfully with Coburn and Steiger turning in two of their most winning performances. It’s undeniable that another major “character” in the film is the score by Ennio Morricone. The maestro outdoes himself here with an idiosyncratic masterpiece that veers from haunting orchestral music to whistling to gritty percussive sounds mirroring the unpredictable pulse of the film itself. Kino-Lorber’s new Blu-ray gives this underrated gem a terrific package, with a very good widescreen transfer and all sorts of extras chronicling the film’s fantastic history. Most were on the previous 2014 MGM release, but they are nothing to sneeze at. There’s an 11- minute survey of the different versions of the film; a 22-minute “Making of…” documentary; image galleries and radio spots/trailers for other Leone films; a “Trailer from Hell” webisode with Oz–ploitation filmmaker Brian Trenchard-Smith; and some shorter extras. A slight problem is the small writing on the disc’s title menu and access to the extras, which could have been easier to navigate. But that’s ultimately a minor quibble, while the DTS-HD 5.1 and DTS HD-stereo mix sounds are clear and especially impressive in the film’s latter action scenes. There are also two sensational audio commentaries here: a new one by director Alex Cox, a devout spaghetti western follower; and Sir Christopher Frayling, author of 2000’s Something to Do with Death, the definitive book on Leone. Both cineastes chip in with all sorts of fascinating facts and insights about Leone and the film’s fraught journey to the screen. Treated shabbily by American distributor United Artists when released in 1972 with various title changes, 37 minutes (!) trimmed for its U.S. release and bookings that placed it as the second part of double-bills, A Fistful of Dynamite has gotten a superior Blu-ray corrective thanks to the fine efforts of Kino Lorber.